In 2010 local people got together with the intention of clearing up a neglected graveyard at Preban, County Wicklow. Since then some of the archeological finds have been remarkable. Scattered around the graveyard are some superb 18th century headstones. 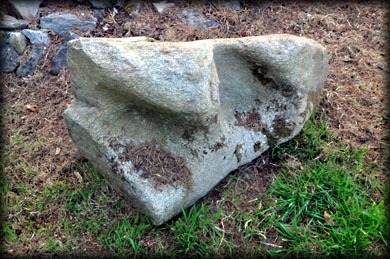 One of these pictured below left, was carved by Denis Cullen a renowned stone cutter from Monaseed, County Wexford. The oldest dated headstone is from 1738. But the most exciting find was by archaeologist Christiaan Corlett who spotted the neolithic decoration on the stone pictured left. If you look closely at the image, you can see four circles at the top left, these were created using a light pecking technique similar to passage tomb art. 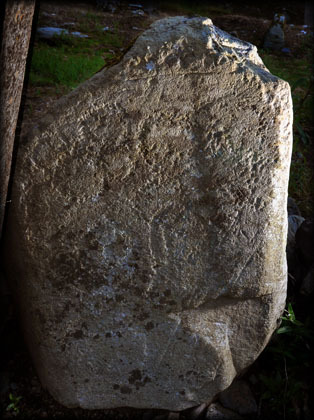 There are two more examples of Rock art found in Preban graveyard. 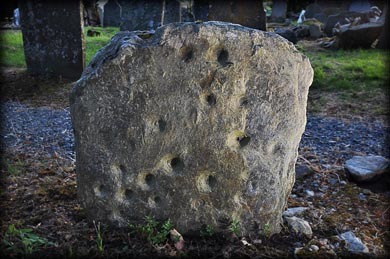 The stones, see top image and below left, are decorated with simple circular depressions, known as cup marks. Both of them have multiple cup marks and have been reused as grave markers, so some of the rock art is buried. The stone at the top of the page is the easiest one to spot, but It took me quite a while to find the other stone. I would not have found the stone with the pecked art without the help of a local man, who worked on the cleaning project. 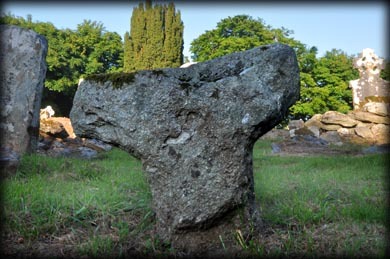 Pictured above is an unusual crucifixion scene on the Denis Cullen stones and an early stone stone they lies against the rubble remains of the early church. Above them, to the right, is an odd looking bullaun stone. Below right is a pic of a tau-shaped cross I spotted amongst the headstones. Situated: From the Main Street in Aughrim head west on Rednagh Road (R753). After 5.6 kilometres you should pass Preban Church on your left. There is a track hidden in the bushes on your right, immediately after the church. Park here and walk up the track. Discovery Map 62: T 0801 7739. Last Visited Jun 2016.